Boatbuilding, and indeed drawing boats is a part time thing here in my world. The days are just not long enough, or there are too few of them or something, the things to do don’t seem to fit in the space available. But todays a good day, springtime is here, birdsong, warm sun, flowers, fresh pale green growth on the trees and those that lose their clothes in the winter are budding. I’ve the day off other things, and it’s a Long Steps building day interspersed with some drawing on another project. Perfect! So its going to be the mizzen mast step box, all the components have been dry fitted, coated with resin and sanded off, and I can, after I chop the socket in the bottom step and the partner hole in the top, fit it all together. I’ll also start the process of fiberglassing the offcenterboard, its all shaped up and waiting, the hardwood tip and leading edge will get two layers and the rest just one of 6 oz . I’m not going to even try to wrap the glass around the trailing edge, I want to keep that square across, about 4mm wide and the cloth wont go around that sharp corner. The mizzen mast step, I've left the near side panel for both the step box and the tiller line tunnel off so the structure is visible for viewers, those bits go on next. Note that the angle of the mizzen mast is slightly more upright than the plans will show, I'm going to use a rather larger area rig than I'd usually recommend, I'll need to reef early but she'll be a flyer in light weather which will help with progress in mixed conditions. 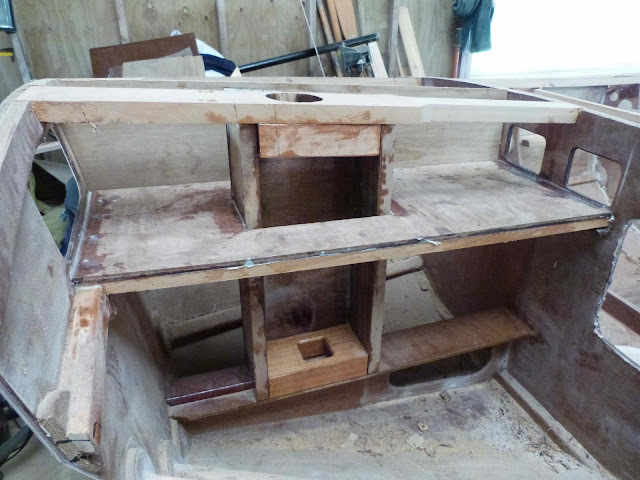 The tiller will pivot on a pin mounted on the forward side of the bulkhead on the right of the pic, that pin will have the same slope as the transom and rudder, and will have a yoke which matches the one on the head of the rudder so I can use solid rods rather than cables. I'm planning to get a couple of rigging screws, cut them in half across the body and put a section of stainless rod in there to make adjustable rods with slotted ends. The glue around the edge of the hatch opening is primer for putting the cutout piece back in, I've come across a pair of nice round hatches that seem a better idea so I need to fill the holes and cut new ones to suit. There is quite a lot of "do as I say not as I do" in this boat, I like to experiment. SEI has been used a lot over the past year or so, mainly as a rowing boat here on the river, picking up trash that would otherwise wash out to sea and keeping me fit. Three one hour rows a week has moved some of my belly up to my chest and added a little to my biceps, and these days the dog watches intently as I walk up to the shed. If I come out with his lead he’s off up to the truck, if it’s the oars he’s sitting in the little boat by the time I get there. Right now though he’s asleep in a patch of sunlight that’s shining through the window. It’s a dogs life! I need to get on and check the last of SEI’s plans for the corrections that John Owens in Texas kindly sent me, I like to have someone test a new set of plans for me for each new design and he built one with the aim of making kits available. I’ve sailed her quite a bit, she’s a good performer, well balanced, very capable in a blow and moves well in light weather too, her RSS sail ( the OZ Racer one http://www.duckworksbbs.com/category-s/376.htm ) is great, sets and performs beautifully and can be used instead of the one I drew, and I’m very pleased. One of the aims of the design was to provide enough stability to make her both sail well and easy to move around in, I find I can jump into her off the dock and walk about in her, lean over the side and drag rubbish aboard, I’ve a friend who has both limited mobility and poor balance and she is able to climb aboard without too much risk of going for an unscheduled swim. So SEI, the next set of plans to be released is a good un. I’d best get on with the work up in the shed though, the job wont get done unless I’m in there and doing it. Long Steps, other builders and a small victory.